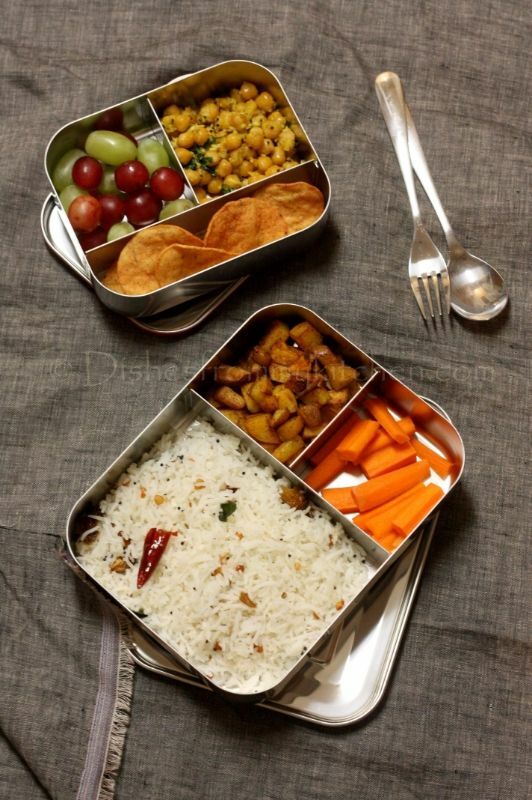 Dishesfrommykitchen: KIDS LUNCH BOX - COCONUT RICE AND POTATO FRY ! LUNCH BOX : COCONUT RICE, SPICY POTATO FRY, CARROTS ! SNACK BOX : GRAPES, SEASONED GARBANZO/ CHICKPEAS AND TORTILLA CHIPS FOR SNACKING ! Make Paste of ginger and green chilli. 3. Heat oil in a pan. Add mustard, Urad dhal and curry leaves. 4. Now add the Asafoetida. 5. Add ginger and green chilli paste. 6. Add cooked Garbanzo. Now add lemon juice and salt. 7. Add the coconut, mix well until everything is blended well. Garnish with chopped coriander. 1. Heat oil in the pan, add mustard seeds once they starts spluttering add the dhals. 2. Now add the chillies and curry leaves. 3. Add coconut and sauté slightly, now add the cooked rice and salt. 4. Mix well and when the rice gets warm enough switch off the flame. 1. Wash potato in fresh water, drain and keep it aside. 2. Heat oil in the pan. Add potato fry for few minutes by closing the lid once in a while until potato is half cooked. 3. Now add all the powders, salt and curry leaves. 4. Cook/ fry the potato in low to medium flame till the potato are slightly crisp on the outside.